The map measures 19.5 inches (48cm) by 28 inches (71cm). It is printed in four colours and is on firm glossy paper. On one side at a scale of 1:73,000 is shown the whole of the Gallipoli Peninsula area from the Gulf of Saros in the north to Troy and Achilles' Tomb in the south, and Suvla Point in the west to Cannakale in the east. On that same side are the indexes which are colour-coded in the same format as all the other maps in the series. 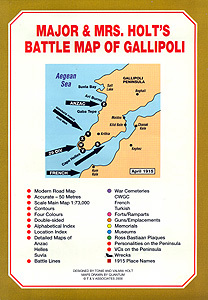 On the other side are expanded maps of the three main battle areas – Suvla Bay 1:43,000, Helles 1:33,500 and ANZAC 1:22,300. Over 60 memorials are shown, some 20 gun emplacements or forts, 7 museums, over 50 military cemeteries and 10 Ross Bastiaan plaques. The Gallipoli peninsula is not overly provided with roads and some of those that do exist can be very narrow, somewhat bumpy and here and there without any substantial tarmac surface. 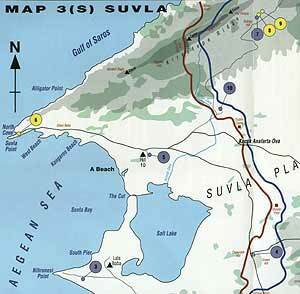 However the map shows navigable routes though in places, such as the routes to Suvla behind B and C Beaches or around the Salt Lake, the roads may vary somewhat from season to season due to the rains. Also marked are the Allied and the Turkish front lines, the landing beaches, the mine lines, the submarine nets, the searchlight positions and the ground gained on 25 April 1915 as well as the areas where the ships sunk during the naval assault are believed to lie. The territory is very rugged and this is indicated by the shading of areas over 150 feet, 450 feet and 600 feet. 1. Location. Thus upon seeing a marker on the map at A42, the Location Index shows that it is the Turkish Mesudiye Gun. 2. Thematic. If looking for the site of the Lone Pine Cemetery the War Cemeteries Index shows it to be at A21.